FRISCO, Texas - Two bodies have been found at the home of a Texas woman under investigation for the death of her son, reports CBS DFW. Police discovered the bodies after 5 p.m. Wednesday at a Collin County home in Frisco belonging to Pallavi Dhawan and her husband Sumeet, according to the station. Officers were responding to a 911 call reporting a possible drowning. Pallavi was facing a grand jury investigation in the death of 10-year-old Arnav Dhawan, whose body was found at the residence on Jan. 29 wrapped in a cloth and placed in a bathtub, but she firmly denied any wrongdoing. 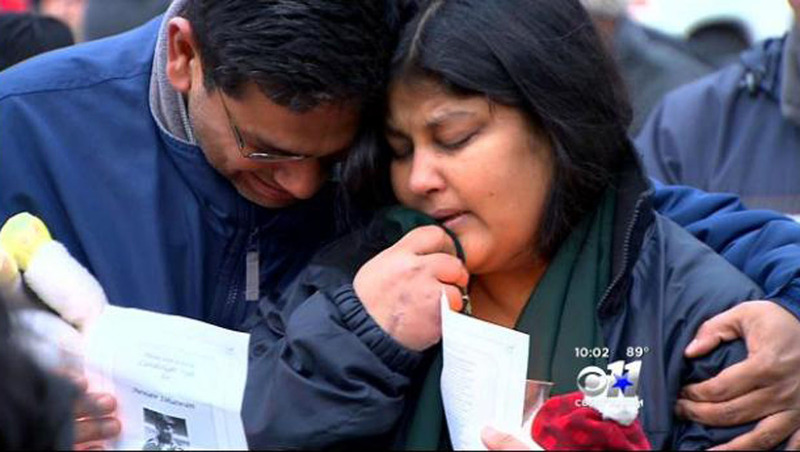 CBS DFW reports it is widely believed the bodies found Wednesday were the boy's parents. The station reports officers surrounded and sealed off the house Wednesday afternoon, but still have not officially confirmed the identities of the dead. Pallavi and Sumeet Dhawan were the only two people known to be living in the home. "It's kind of unbelievable something like this would happen in our community," neighbor Lonnie Moore told CBS DFW. According to the station, a lot of police activity centered at the back of the home. Sources said that one body, a male, was found inside the house while the second, a female, was outside in the swimming pool. Neighbors told the station they heard gunshots over the weekend, but thought it might have just been dove hunters in a nearby field and didn't report the incident. They said a back door at the home had been open at least since Tuesday. It is unclear how long the bodies had been deceased at the residence. Both Pallavi and Sumeet Dhawan testified in front of a Collin County grand jury last month, the station reports. The mother had always claimed her son died from a seizure caused by a pre-existing medical condition and that she had attempted to preserve his body according to Hindu customs, waiting for her husband to return home from a trip before contacting authorities. The medical examiner's report said natural causes were the most likely cause of death. The boy's parents said Arnav was born with a brain and skull that didn't fully develop. They said that, following tradition, last rites would have been performed on their son once Sumeet returned home, and then the boy would have been cremated. However, school officials at Isbell Elementary - where Arnav was a fifth-grader - notified Sumeet while he was out-of-town that his son had missed class for several days, the station reports. Upon returning home, Sumeet called police and said he was concerned for his wife and child. During the investigation, Sumeet allegedly told police that he and his wife had been having marital problems for a few months, and that Pallavi was coping with mental problems, according to the station. CBS DFW reports the family said they felt as if they were being singled out by authorities because of cultural bias, and that police did not understand their requirements as Hindu parents. The Dhawans had been fighting since January to have a number of their personal items - including their car, fax machine and passports seized in the investigation - returned. While a grand jury mulled a possible murder indictment for Pallavi, the family was also facing financial strain, in part because they had to rent a car while theirs was being held by investigators. The car was returned in May. Sources told the station the family had been trying to travel back to India but was unable to do so, having been made to surrender their passports.